Prime Minister Binyamin Netanyahu eulogizes Minister David Azoulay at special Cabinet session in his memory. 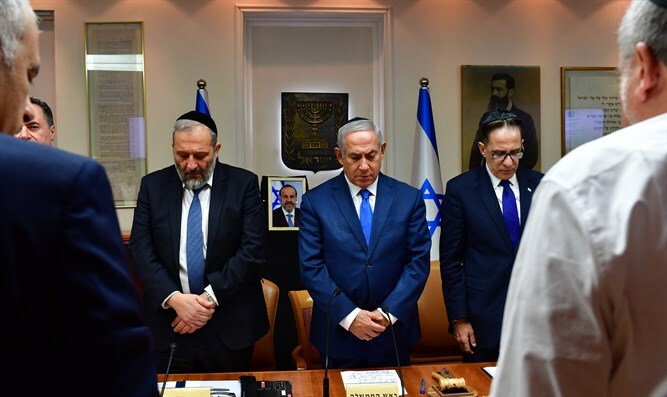 The Cabinet convened on Wednesday evening for a special session at the Prime Minister's Office in Jerusalem, in memory of Minister David Azoulay, who passed away on Tuesday after a lengthy battle with cancer. “He was always connected to his roots. He was born in Morocco, immigrated to Israel at age nine, and carved out his own path. He was educated in the Torah of Israel and respected Israel's great Torah scholars. Before he was in the Knesset, he was a man of education who conquered the hearts of his students and imbued them with these things – love of Israel, in dialogue. He was a man of dialogue and mutual respect. He brought this with him to the Knesset and the Government, these same exact qualities,” continued Netanyahu. “David sat here in meetings and I looked at him; he was very interesting to look at. He did not speak much but when he spoke it was always substantive and to the point. He behaved according to the rule, a golden rule – say little and do much. I would always look, if he had something to say, I would always listen to him because he always touched on some point, not often, but he made his point,” Netanyahu added. “He drew his strength from his family. I know that he always made the time to talk to his mother, I think almost every day, with his wife Pnina and with his children. He was proud when his son Yinon entered the Knesset; there was no one prouder and the torch of service as passed from generation to generation. Of this it is said , ‘He restored the hearts of the fathers to the children, and the hearts of the children to the fathers.’"
“May his memory be for a blessing. From here I would like to send the condolences of the entire Government to his beloved family and we do this on behalf of the people of Israel," concluded Netanyahu.